Is there anything better as a kid than waking up on Christmas morning to find new hockey gear under the tree? 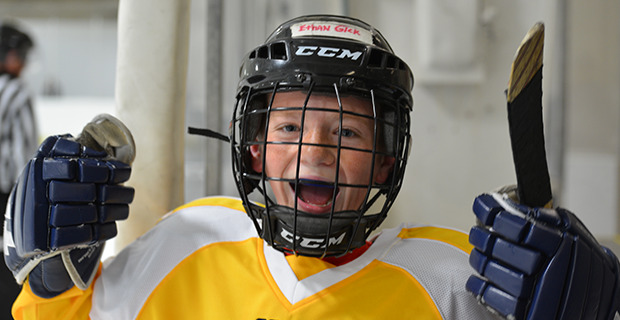 For me and I’m sure pretty much every young hockey player out there, getting a new stick, socks, skates or pads was one of the best parts of the holiday – even if Santa had a tendency to choose things you had to grow into. And we’re excited to help you find some new creative ways to make the hockey players on your list even happier this year. Our Christmas Gift Guide is finally here and it’s chock-full of time-tested favourites mixed with some cool new training equipment, books and so much more that will give you some great ideas of what to put under the tree this year. Our Gift Guide is also available online in case you want to bookmark or share some of these gift ideas. Also online are our Fans’ Choice Awards, which will be announced in a few short weeks. Don’t miss the chance to help your hockey favourites get recognized. Voting is super easy and you can vote in as many or as few categories as you’d like. Voting closes Dec. 1 and winners will be announced in our Dec. 20 edition. But before then, we’ll be bringing you some great content leading up to the World Juniors, including a brand new feature looking back at our favourite WJC memories over the years, including some big moments for some of our Minor Hockey Players of the Year. 2013 B.C. Player of the Year Dante Fabbro is expected to wear the red and white again in his final year of eligibility, and 2015 Ontario POY Gabe Vilardi is also looking really good to crack the roster. We’re still a few weeks off from finding out who will be heading to Buffalo, but that won’t stop us from speculating in the meantime. Fabbro and Vilardi have been doing everything right, and of course it would be great to once again see some of our former winners competing on the world stage. And it won’t be long until we have some new winners to add to the list. Last month, we opened up our judging process for our 2018 Minor Hockey Players of the Year in B.C., Alberta and Ontario. Make sure to check out the latest regional shortlists in this edition and online. Finally, with the year wrapping up, the Olympics are just around the corner and the Team Canada women are starting to take some big steps to narrowing down their roster and getting the team ready. You can tell by the quality of the cuts so far that we’re going to have a huge team. Make sure to follow us as we bring you tons of exclusive content on the road to PyeongChang. We hope you enjoy the new HockeyNow CRAVE: Christmas Gift Guide. Make sure to pick up the November edition at the rink, follow us on Twitter and Facebook, and sign up for our newsletter so you can catch all the latest from us. And don’t forget to vote for your favourites in our 2017 Fans’ Choice Awards!